Labours of Love by Deborah A. Brennan, is an honest and compelling look at what it means to be an adoptive parent, an adoptee, and a birth parent. I may have briefly thought about writing a book when I was in elementary or high school. Funny; because I’ve never been much of a reader. My curiosity in literature was primarily confined to current events, autobiographies and special interest issues. I love reading magazines, newspapers and editorial commentary – perhaps indicative of a short attention span. I grew up in rural Ontario, one of three daughters of a United Church minister, and my mother, who was the daughter of missionaries, and spent the first 17 years of her life in China. I believe my childhood experiences helped me to become a keen observer of human nature, a fascination that continues. I went on to graduate in Interior Design from Ryerson and worked as a retail design manager for sixteen years. My plan of marrying and having a family before turning thirty got buried under blueprints, and it wasn’t until I was 38 that my husband and I welcomed our son Daniel into the world. When Daniel turned 2, I decided to retire from the world of financially compensated employment and focus on the other kind. The kind where you work three times as hard, and no pay cheque ever appears. Of course, this is actually when the greatest fulfillment in my life began. The four years I spent with Daniel before Diana joined our family in 1999 and the nine years since then, have taught me the most valuable lessons of all. I had no idea where the path of Diana’s adoption would lead me. 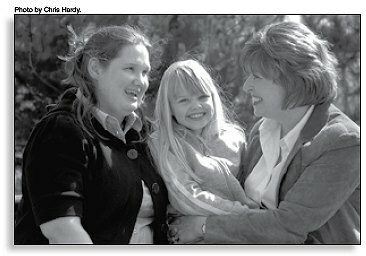 I could have chosen to remain within the “safety” of our personal adoption story and experiences. But there have been too many questions; too many curiosities on my part that speak to the “human nature” thing I mentioned earlier, for me to ignore. So here I am; with a book that began with a personal need that I had a decade ago. I hope within the pages of Labours of Love you will find some answers you might have been looking for.